Contemporary art galleries and shopping centres have swapped places | Daily Review: Film, stage and music reviews, interviews and more. 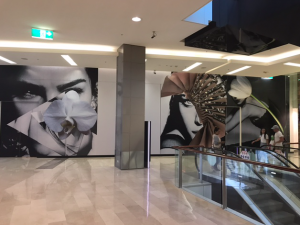 Artist Scott Redford argues that there is no longer any difference between the contemporary art shown in public galleries and the commercial visual imagery used in shopping centres. It has finally come to pass. We have become Them. 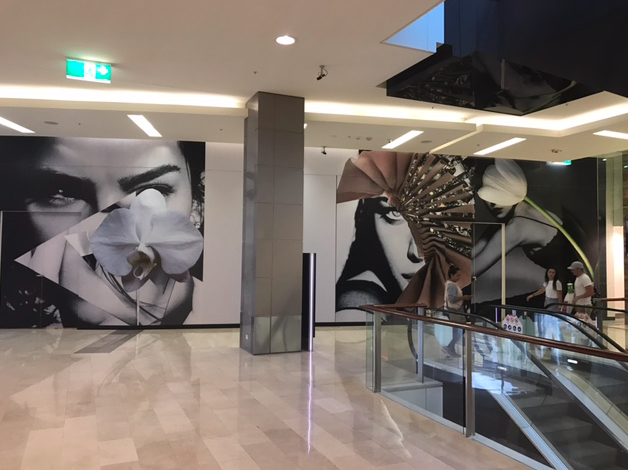 The best contemporary art show in Brisbane right now is Dina Broadhurst’s massive set of photo murals at the Chermside Westfield Shopping Centre (pictured above) and the best popular culture extravaganza is at the Queensland Art Gallery’s GOMA with Marvel: Creating the Cinematic Universe (below). The latter is a display of the work of production designers, storyboard and previsualisation artists, costume and prop designers, and visual effects artists who make Marvel film franchises, some of which have been filmed on the Gold Coast. It’s the type of pop culture exhibition that used to be held in shopping centres or convention centres. Dina Broadhurst is a young, art savvy, Sydney interior designer. Her huge fashion montage cut-ups at Westfield seem almost too easy until one realises how Broadhurst has brilliantly overcome Westfield’s problem of a constructing a huge, new wing that could potentially be full of empty shops. Its solution? Give Broadhurst not only the shop fronts to use but also huge swathes of every available wall. By co-opting fashion’s visual language, Broadhurst amplifies it, with what looks like a nod to Jeff Koons, James Rosenquist and perhaps even Salvador Dali. Our state and federal governments have now annexed the Contemporary Art they once merely tolerated. The genius here is Broadhurst’s mastery of scale. 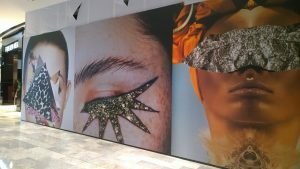 Her cut-ups are overblown enough to swamp the commercial imagery around them without really taking anything away from the commerce, because she is using the same language as the visual merchandisers in the Westfield shops. In short, this is Wow Factor 101. There’s a story about a king who ordered an ever better and better map of his kingdom until finally the map became as big as his kingdom. This is also the story of contemporary art and our major cultural institutions. NGV, QAGOMA, AGNSW, MCA… they all want one thing — the biggest audience numbers to please their “king” which is the Australian state and federal governments who employ them. Stand in a Westfield or GOMA and blur your eyes and both look and feel the same; certainly the architecture is the same. In this singular effort to attract more and more visitors, our once happily conservative art institutions have had to change. Our state and federal governments have now annexed the Contemporary Art they once merely tolerated. Cafes, baby crèches, over 55- evenings, young hipsters’ evenings with bars and music, face painting and cupcakes abound in our public art galleries. Contemporary art (and the traditional art of previous times they also show) has been rendered the equivalent of family fun in a free, air-conditioned setting. The more our art institutions ape the trappings of the public spaces in the real world, the more the differences that distinguished lofty art institutions from the real world, shrink. Stand in a Westfield or GOMA and blur your eyes and both look and feel the same; certainly the architecture is the same. Stand and admire a beautiful huge glamour portrait of actor Eddie Redmayne outside the Louis Vuitton store at Pacific Fair on the Gold Coast and then stand in front of an equally glamorous life size portrait of a Maori warrior at GOMA in Brisbane and one realises that these objects are the same, even down to the subtle and complex play of identity in each photograph. Contemporary art is essentially the same as any profane object in the real world but the ‘art world’ loves to think of itself as superior to the ‘real world’. 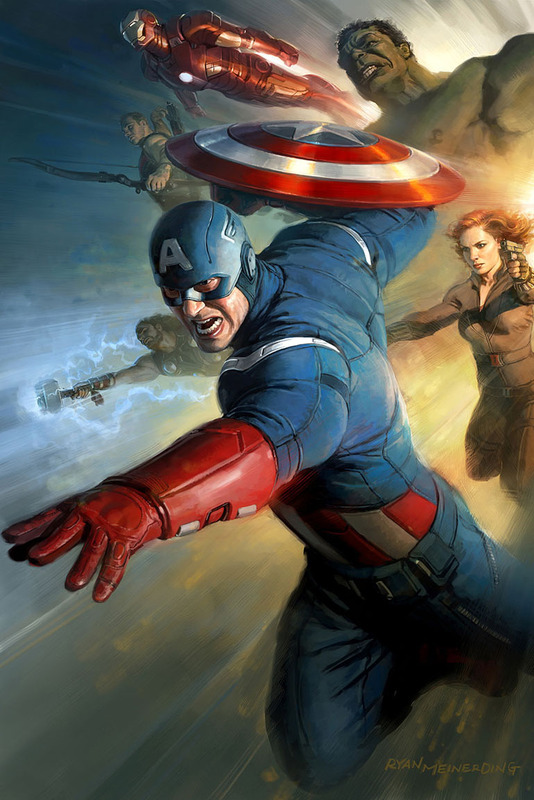 In the beginning there was ‘the image’ but now the contemporary ‘popular image’ has won. Dina Broadhurst x Westfield Chermside from Westfield Chermside on Vimeo. RELATED STORY: SUPERHEROES AT GOMA, ART OR JUST A SOCIAL DOCUMENT? Next Post Have we reached Peak Risk and how can we deal with it?